With nearly 100,000 kilometers of coastline and 23% of the world’s mangroves, Indonesia plays a crucial role in maintaining our global stocks of blue carbon – carbon stored in coastal ecosystems, at a density of up to four times that of terrestrial forests. It is becoming imperative that the archipelagic country’s fills its policy gaps for effectively managing these landscapes, and that it does so soon and with science. 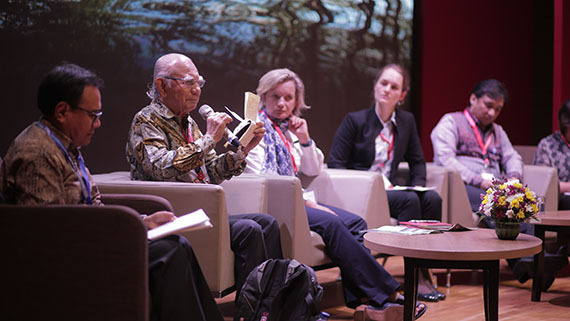 Organized by CIFOR and partners, the Blue Carbon Summit brought together 240 national and international high-level decision makers and scientists, putting their heads together on how to effectively regulate these landscapes, and what data, finance and partnerships are needed to do so. The outcomes will inform a set of white papers to be used by the national government – and carry over into international policy as well. The clock is ticking for the AFR100 challenge of restoring 100 million hectares of degraded African landscapes by 2030. How can we achieve this continental goal? This 29–30 August, actors from local communities to global governments will together create new concrete actions to turn restoration into reality at GLF Nairobi. Don’t miss this pivotal event! There is still time to register as an early bird and attend or watch live online. Why are women okay with gender inequity? The wheels are in motion for GLF Bonn 2018, which will see more than 1,500 attendees from all sectors and parts of the world convene in Bonn, Germany, 1–2 December to take action on climate change. Stay tuned as we announce the theme and agenda for the culmination of our year! 8 Aug 2018, CIFOR Headquarters, Bogor, Indonesia. 29 - 30 Aug 2018, United Nations compund, Nairobi, Kenya. 12 - 14 Sep 2018, San Francisco, United States. 22 - 27 Sep 2018, Bandung, Indonesia. 1 - 2 Dec 2018, World Conference Centre, Bonn, Germany.